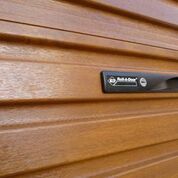 TiltAdor started manufacturing roller doors in 1983 and now has two ranges of roller doors. 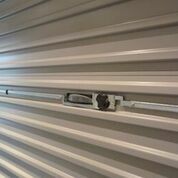 Our engineering experience and the little extras that we include in our roller doors, ensure you are getting the best designed roller door in the market: it really does stand out from the competition. It’s our commitment to high quality that makes us first choice with architects, contractors, developers and homeowners. The difference is in the detail . . .
TiltAdor uses a press brake to form the ribbed curtain of the door. The deep pressed squareline profile gives extra strength and an improved stylish appearance. This production method reduces the deflection (or waviness) in the door curtain which can be particularly noticeable in roller doors manufactured using a traditional roll forming machine. 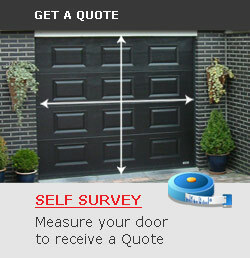 At TiltAdor, we understand that you want your door to look good and operate reliably. That’s why we add in several unique components to our roller doors. All these features will help your new garage door perform well for many years. Castellated steel drum wheels (A) are specially formed to support the shaped curtain of the door. These provide a strong secure connection to the springs, give the door added strength and reduce the headroom required. Combination of drum and multiple precision spring system (B) to ensure perfect balance every time. The top sheet of the door is curved (C) using a bespoke machine to reduce stress on the door curtain where it is fixed to the drum wheel. A steel separator (C) protects this curve and helps eliminate scuffing and rubbing as the door opens and closes. Heat –treated springs (B) are designed and tested to exceed 25,000 spring lifecycle. Double wheels at each side (E) of the door eliminate shuddering, reduce sticking and provide smoother, more reliable operation. 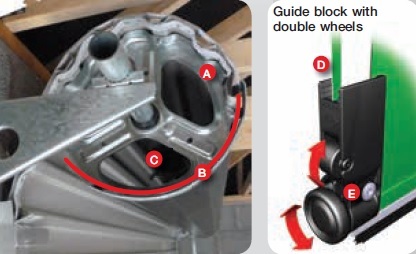 Wheel assembly (E) houses the Nylofelt™ so that it is not wrapped around the bottom of the door. This feature is very important as it stops the Nylofelt™ being damaged through contact with the ground. Nylofelt™ nylon braided running strips ensure smooth, quiet, greaseless operation. Our Nylofelt has a rubber core to reduce wear and tear on the braiding and to maintain its shape. 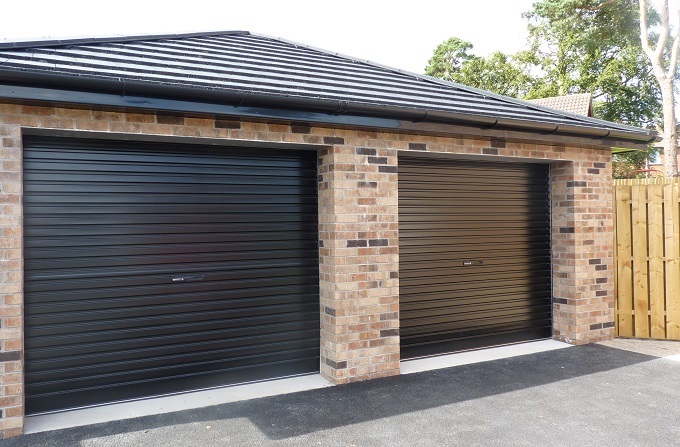 Manual doors feature a stylishly designed centre lift lock, which not only looks good but allows you to secure the door from inside or outside the garage. A highly pick resistant 6 wafer lock barrel mechanism and double bar locking action come as standard. Fully CE marked and compliant with the EN 13241-1 safety standard. Special heat–treated springs are designed and tested to exceed 25,000 spring lifecycle. Steel drum wheels give a secure connection to the springs and, unlike plastic equivalents, will not crack. Strong, durable aluminium guides with safer rounded edges (RollOver and Roll-A-Door ranges). 44mm ‘wind-lock’ aluminium guides on the RollOver range help prevent the door being prised from the guide. Stylish and sturdy cast aluminium lock (not plastic) with a highly pick-resistant 6 wafer lock barrel mechanism and double bar locking action as standard. Locking bar end covers reduce the risk of finger trapping as the door is closed. Supplied as standard for your protection. Now that TiltAdor has done all the hard work ensuring your door will look great and operate reliably, all you have to do is choose from our Roll-A-Door or RollOver range and, of course, pick the colour.